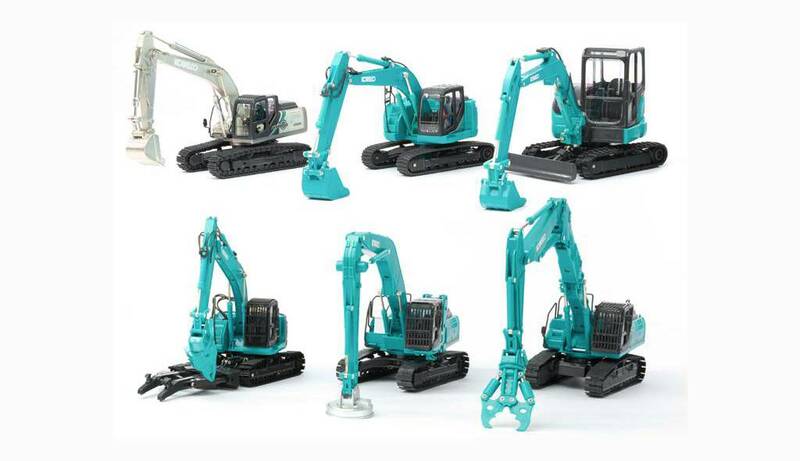 In 2018 Kobelco is pleased to announce that we are producing two new models. The SK500LC-10 and the ED160-5 Blade Runner both with the collectors scale of 1:50. The SK500LC-10 is our most powerful excavator and this model will be produced by Conrad from Germany who have a long and established history of producing quality models. What we liked about Conrad is that they produce all their models in Germany and after visiting their offices and production plant last June, we were able to see the dedication of their staff putting the models together with care and attention. Conrad also have a museum in their offices which is heaven for collectors. Be sure to go to their Open Day in January if you want to see it. Seeing the production of the models is fascinating and we hope to visit Conrad to film the production line and take some photographs to show you the step by step process. In December we had our ''first show'' of this model, we were able to see a 3D model for us to check. First impressions are that this is going to be a great addition for collectors and we are excited to see the final model. We will have 300 models ready for the Intermat event in Paris (23rd to 28th April) and the models will be on sale at this event exclusively. We expect the model to hit the Fanshop in May 2018. If you want to buy the first model come and see us at Intermat! The ED160-5 Blade Runner machine is one of our favourite excavators with its 6 way dozer blade and curved tracks making this a great machine on uneven terrain. For this model we have chosen the supplier ROS from Italy. Their tooling is made in Italy and production is in China. We chose ROS due to their commitment to visiting us and showing us lots of different model samples and listening patiently to why this machine is special and needs to be made with attention to detail. ROS were so keen that they visited our Amsterdam Port to see the Blade Runner arrive off the boat and they took detailed photographs and video of the machine and are committed to producing a high quality model. We expect this model in July 2018. End of this month we will update the blog with all 2019 models coming. We have quite a few nice ones! Will we get an update like this this month of which scale models will be produced in 2019?